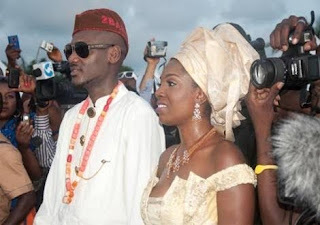 A photographer named Emmanuel Okolo, has dragged singer Tuface Idibia, his wife Annie, and one Antonio Anifite before a Federal High Court in Lagos in a N120 million copyright infringement suit for allegedly using photographs he took of them at their traditional wedding in Uyo, Akwa Ibom State in 2013, without giving him credit as the owner of the photos. According to a report by Channels TV, in the suit which was filed before Justice Mohammed Idris, Emmanuel claims that during the couple's wedding in 2013, he took some photographs and watermarked them using his company name. Emmanuel says that some days after the wedding, Annie contacted him and asked for the photographs which he immediately sent to her. Upon receiving his photos, he said Annie complained about his watermark on the photos and asked that they be removed. He said Annie sent Antonio Anifite to negotiate with him. He claims that he immediately released the photos to Antonio free of charge with the understanding that when it will be uploaded on Tuface's personal website, “2faceonline.com”, he will be duely credited. Emmanuel says he was surprised to find out that when the photos where uploaded, 148 out of the 355 high resolution photographs he took were uploaded with "2faceonline.com" watermark on them. Emmanuel who claims to be a certified film maker from the prestigious London Film Academy and a holder of a Masters of Arts degree from Cardiff School of Creative and Cultural Industries, South Wales, United Kingdom, says he suffered general and exemplary damages which he is seeking 120 million Naira compensation from 2face, Annie and Anifite. However in a counter suit filed by the Idibia's for which they are claiming N150 million in damages, they say Emmanuel was never invited by them to take photos at their wedding, that he was just one of the many uninvited photographers who came to their wedding to make some money via photography. The Idibia's in their suit, say that after their wedding, they noticed strange copies of their wedding photos in circulation with Emmanuel's studio watermark on them and after finding out they were taken by him, they approached him, expressing their displeasure. He apologized and also forced the photos on the Idibia's, saying he wants them to use it so he can leverage on their popularity. They however made him understand that the only way they will use the photos was for his watermarks to be completely removed. This he allegedly agreed to. 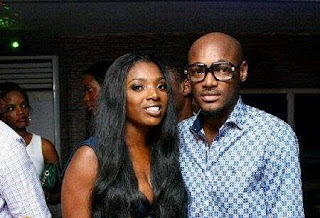 The Idibia's say they were shocked when after uploading the photographs, he wrote a pre-litigation letter to them demanding that his watermarks be boldly inscribed across the photographs and a letter of apology. The Idibia's say the photos were immediately pulled down from 2face’s official website as the watermarked photos would distort the original idea of his website. “The second plaintiff (Okolo), through his several guile, deceit, cunning gate-crashing and opportunistic posturing carefully planned and orchestrated the entire events leading to the institution of this suit with the express intention of embarrassing, harassing and blackmailing the first and third defendants (Annie and 2face) with a view to extorting money from them,” they further claimed in their counter-claim. They accused the photographer of having a premeditated plan to blackmail them and extort money from them. They urged the judge to order Okolo and his studio to pull down all the photographs of them that the photographer had circulated. They are also praying the court to order Okolo and his studio to “render forthwith, account as well as make full and frank disclosure of all sums and profit made by them as a result of unauthorised commercial usage” of their photographs.